Not really a model engine and so far just an idea! Playing in my shed at Ashburton, New Zealand. ...another one from my series of ideas and concepts I doubt I will live long enough to enact!!! This is a concept for a solid fuel internal combustion Carnot cycle engine (or at least a variation on the Carnot cycle). 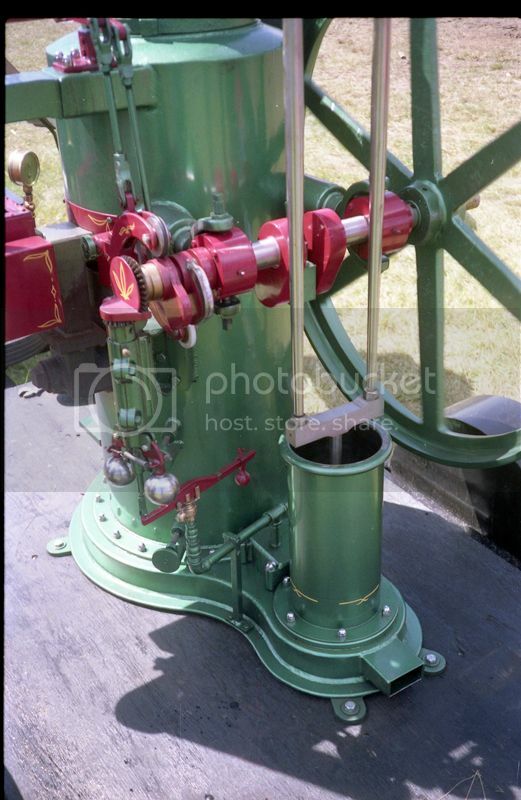 There is a cylinder on the left which acts as a simple air pump and is shown with two flap valves. The cylinder on the right is the power cylinder and is somewhat bigger than the air pump cylinder. The exhaust valve is shown as a poppet valve and is in the head of the piston which would allow the valve to be operated by a cam on the crank pin. The centre vessel is the combustion chamber which is double walled. Solid fuel such as charcoal is loaded into the combustion chamber through a removable lid. Cold inducted air passes through holes into the inner chamber. Hot expanded air moves from the inner chamber and acts on the power piston. Starting the engine would require a small amount of fuel to be lit and dropped into the inner chamber and the chamber filled with more fuel then the lid clamped in place. The engine would then be turned forcing fresh air into the inner chamber fanning the fire and the resulting heated combustion gasses would be passed to the power cylinder. The engine would be throttled by restricting air intake. I dont really know if this would work and I have no idea how long it might run between refueling and relighting. More importantly I dont know what the ratio should be between the volume of the air pump and the power cylinder. The choice of solid fuel is partly for the simplicity compared to managing a liquid fuel system and of course partly for the novelty value. The principle of operation is akin to that of a jet engine. P.S. On reflection I think the two cylinder could be oscillating and even double acting. Re: Not really a model engine and so far just an idea! I think it might work, but the pressure build-up in the combustion chamber may interfere with the burning of the fuel. It might be best to introduce air into the chamber below the burning fuel. It shouldn't be too hard to build a simple prototype and see if it has any potential. John, the way I see this working is as a flame licker, flame in the middle, air pump blows hot air into power cylinder, valve closes, piston moves to TDC, valve opens piston goes to BDC drawing in more flame, etc, etc. A supercharged flame licker. With a fire of solid fuel, and a blower, you would have to watch out for bits getting into the power cylinder. Perhaps Peter Lyne could put it on his bike instead of the Stirling Engine. As far as I can see you have a continuously-burning remote-combustion-chamber configuration, but the compression ratio is rather low. You'd have to run the combustion chanmber at high pressure to get any thermodynamic advantage from it (so that it had the spare "overhead" to drive the inlet blower), and that means the valve between the combustion chamber and the power cylinder would need to be positively operated rather than a flap-valve. Actually I suspect you have a fundamental issue with the pressures in the combustion and inlet-blower chambers. You want a pressure rise in the combustion chamber because that's where your power is coming from. But if this pressure is elevated the inlet blower won't develop enough presser to open the flap-valve. OK, thanks for the comments. I am thinking that oscillating cylinders might be the easiest and most effective configuration as well as double acting. I dont know how much power there will be after friction losses but hopefully enough to be able to run. Presumably any increase in the internal pressure will encourage combustion. Yes, there may be an issue with ash getting into the power cylinder which is another reason to use an oscillating cylinder where the head can just be unbolted and the cyclinder wiped out. This is closer to a Brayton heat engine than a Carnot engine. Most Brayton engines are usually external combustion. A Ericsson heat engine is about as close to a Carnot as is practical. Most Brayton engines are usually external combustion. Hmm - most Brayton cycle engines (by population) are jet engines/gas turbines. This engine burns coal and draws air through the coal fire to drive the power cylinder. 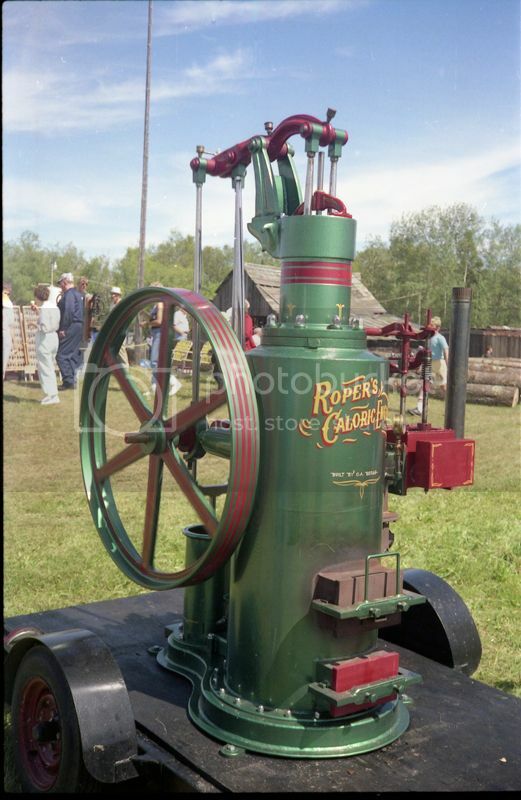 It is a Roper Caloric Engine built by Mr. Olaf Berge of Cass Lake, Minnesota. He built it from his own castings and used the Roper patent drawings to do this. I saw it at the Lakehead Harvest Reunion in September 1988. Mr. Berge said that the fly ash from the coal does cause the valving to stick. An internet search for "Roper Caloric Open Cycle Hot Air" will bring up results. That is a beautiful "ole" machine. Bad Behavior has blocked 16544 access attempts in the last 7 days.